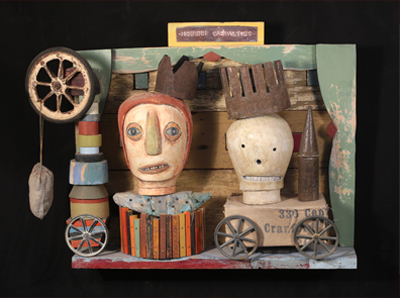 Using a combination of carved and painted wooden forms, aged metal, found objects and various bits, Bill Skrips seeks to convey narrative in his sculptural work. At times literal and sometimes abstract, the “stories” the artwork tells can come across as apparent or obscure. Influenced by outsider and folk art, Skrips strives for a union between the humorous and the dark, which reflects his personal view of the world. The work rarely edifies or draws conclusions: He prefers to pose the questions and stand back. Raised in the wilds of blue-collar New Jersey, Bill attended art school in NYC, then moving there for the art scene. he spent 27 years in NYC, eventually finding urban life overwhelming. He left Soho, returned to NJ and began to work with found materials (influenced by his father, who saved everything), combining these bits and pieces with painting, carving and welding. “Using a combination of carved & painted wooden forms, aged metal, found objects and various bits, I seek narrative in my sculptural work. At times literal and sometimes abstract, the “stories” the artwork tells can come across as apparent or obscure. Influenced by outsider and folk art, I strive for a union between the humorous and the dark, which reflects my personal view of the world. The work rarely edifies or draws conclusions: I prefer to pose the questions and stand back. The resulting playfulness of this approach is balanced by the grittiness of my materials. The gratification of transforming, mixing & mingling found materials into my work feels like I’m making good on some old promise or spiritual debt. The found elements and fragments, with their soiled qualities, imperfections and unknowable history, help to drive the work.